Anyone know why I am seeing the error in the screenshot? If I tap on the forum the error goes away and then I can use the program normally. I get this when I am in the forum also not just the forum selection screen. I've un-installed and deleted the program folder off my phone then re-installed and that did not help. If it helps I am using a Nexus 6P with Android 6.01. Switch over to Tapatalk app. I just installed it. Is there a way to see all new posts like you can on the web page? The tab you need to view is unread. Move tabs to left and select the gear for view settings. This looks and appears to work so much better than AutoGuide. I hope this continues to work. I saw the post from 2013 where it was announced that tapatalk would no longer work with Lotustalk.com. I hope it continues to work. we posted way back in November 2015 that we would no longer be supporting the tapatalk version of the Autoguide app. It's still usable if you tap anywhere outside the message box. 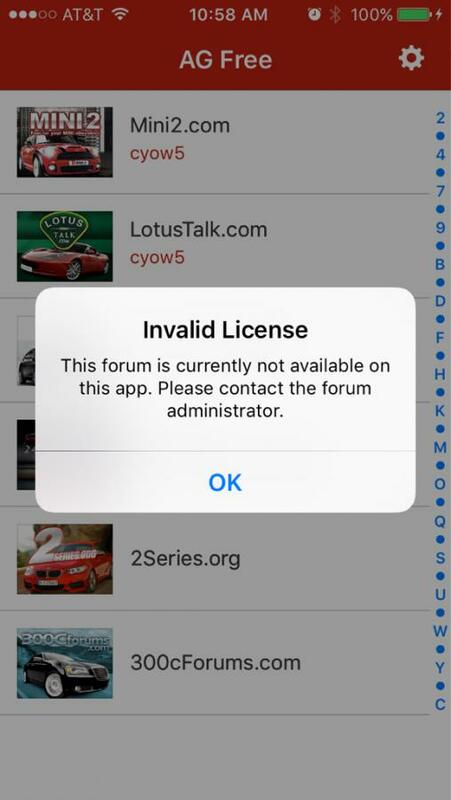 So why are we getting the license error message using the "new" app? @wfink , Are you still receiving that error on the new Autoguide.com app? I am using a Samsung 6 Edge, and I am able to access the forum just fine using the autguide.com app. Still getting the message. iPad with the latest version of the OS. I'm getting a license error as well, but that's different from the one at the top of this thread, right? My app works fine after I acknowledge the error. Post a screen shot of the error message. I think you guys are still using the old app. The new app looks more like the enhanced mobile view. In using the AutoGuide app. Are there two? Here's mine. Lousy shot using a cell phone. Nevertheless, you can see what it looks like. New app on my iPhone looks like this, bummer is I had the paid version before and now it's gone.